I found yet another fun, cheap way to give myself a french manicure! I posted the Sharpie mani the other day, and then I stumbled upon the bandaid mani on Pinterest! 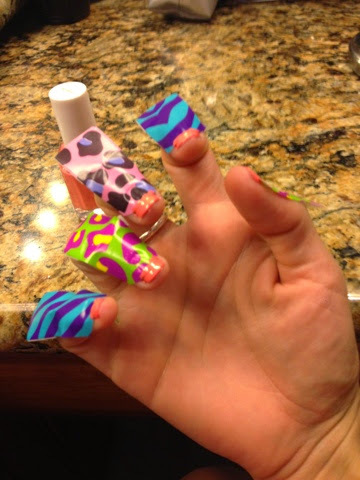 I painted a clear base coat, then used fun color Forever21 bandaids - cut 5 in half, then stuck them on my nails, with as much nail showing as I wanted painted. Then painted 2 coats of Essie Tart Deco on the top of the bandaid, and let completely dry. Then I peeled them off from 1 side to the other, and put clear top coat on. Voila! So cheap and easy and perfect in a pinch! My mani doesn't last too long anyways, so this was perfect to do while getting ready to go out for my birthday dinner over the weekend! I hope you enjoy it and let me know if you try it! oooh, thanks for the tip! I will get some regular plastic tan ones! thanks for the love!